Argentina faced a huge crisis at the end of the ’90s. After years of being the “best student” of international economic institutions such as the International Monetary Fund and World Bank, its economy went into a recession in 1998 that led the country to a political and social crisis that reached a boiling point in 2001. During this crisis thousands of people protested daily against the government. Some of the protests were organized by unions, some by other civil society organizations and others were spontaneous. The last chapter of this story is well known. The government repressed the protests, allegedly killing more than 30 people in December of 2001. However, the president was forced to resign and Argentina experienced a period of political and economic instability, which included five different presidents in a few weeks, and the declaration to default on its external debt. For the workers and the unions the outcome of this process was devastating. Its origins lay in the military government that ruled the country between 1976 and 1983, setting ground for the implementation of neoliberal policies during the following decades. The average real wage in 2001 was 43% less than the 1975 real wage and after the devaluation of the currency in 2002 the unemployment rate reached almost 25% (against an average rate of 5%-6% during the ’80s) and the non-registered workers by that time were 49%. At the same time, the Argentinean economy suffered a huge transformation, with an increase in the importance of finance, and the virtual extinction of “big industry”. Many factors have contributed to the recovery of the Argentinean economy since 2002. These were mainly the devaluation of the currency, which allowed industry to produce with lower costs, and the changes in the terms of trade. The increase in international commodity prices that are exported by the country were of particular importance over the last decade. These objective conditions were taken by the new center left government since 2003, encouraging economic growth by implementing a policy that strengthened the internal market. 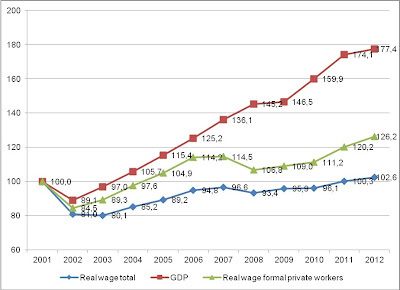 However, after 10 years of continuous growth in the economy, the real wage has just reached levels that were presented before the crisis in 2001, while the Gross Domestic Product has experienced an increase of 77% (see chart n° 1). Obstacles to increase real wages have become stronger since 2007 when the annual inflation rate reached around 25%, and remained between 20% and 25% a year till now. The persistence of this inflation rate, the highest within South American countries, for more than six years (with the only exception in 2009) also put some doubts on the sustainability of the Argentinean economy in the middle term. 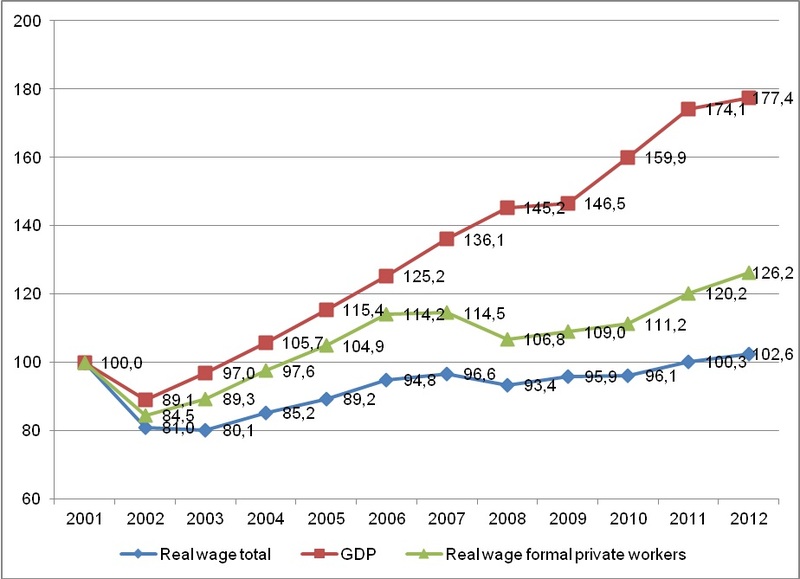 This gap between the evolution of the GDP and real wages can also be seen in the performance of companies. 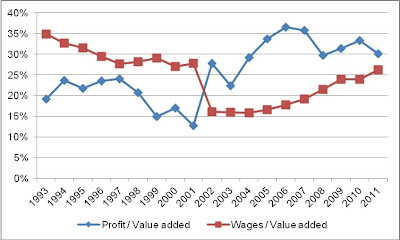 In fact, the rate of profit in the biggest firms in the country (most of them transnational) has doubled compared to the previous decade, while the participation of wages in the value added by those companies is just reaching the 2001 level (see chart n° 2). Source: National Institute of Statistics and Census (INDEC). The situation in the labour market also shows some critical aspects. Firstly, unemployment and underemployment remain at one of the highest levels in Argentinean history (between 7% and 8% each), although they are lower compared with the situation in the ’90s. Secondly, the economic growth during the last decade was not able to recreate a unique formal and structured labour market, which still presents strong evidence of fragmentation. The last available information (4th trimester of 2012) shows that the formal wage workers only represent 50% of the labour force, while the other half is formed by informal workers, self employed and unemployed. The increase in outsourcing has also contributed to the existence of a gap within formal wage workers, imposing more obstacles to union strategies. The persistence of high levels of non registered workers (informal workers) is a new characteristic of the labour market in Argentina. In fact, this sector was almost residual until the ’90s, when it started to grow in a significant way. The recovery of economic growth since 2003 helped to reduce the amount of informal workers. However, the rate of non registered workers has remained stable since 2007, in one of the highest levels in Argentinean history. In other words, despite an economic growth of almost 80%, the informality in the labour market is still at a high level. 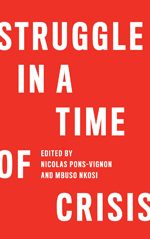 Considering the changes in the pattern of economic growth and the persistence of the fragmentation of the labour market, it is possible to inquire which, are the main challenges for the labour movement. In the last decade Argentinean unions have recovered collective bargaining as an instrument to struggle for wage increases. In fact, they were able to establish a yearly round of wage collective agreements since 2006. These agreements are bargained at the industry level, and they cover workers and employers all over the country (the covered rate within formal wage workers is between 60% - 80%). At the same time, the union density rate in Argentina is the highest in the region, with almost 40% of formal workers being members of a union. And in the last years, the labour movement, in particular in the formal sector, has engaged in many strikes and struggles in general, allowing them to increase real wages and to recover, at least partially, certain rights that were lost during the ’90s. 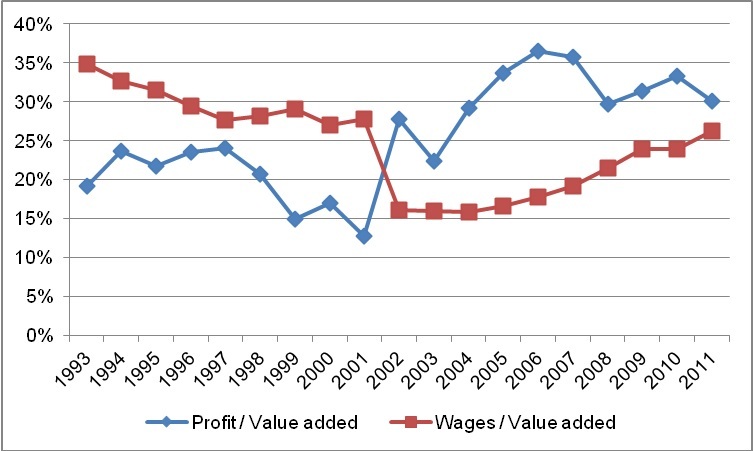 As we can see in chart n° 1, formal workers in the private sector (those covered by collective bargaining) received higher wage increases between 2001 and 2012 than average workers (26, 2% vs. 2, 6%), while informal workers have just reached the levels of 2001, and workers in the public sector suffered a huge drop in their real wages (38% less in 2012 comparing with 2001). Facing this situation, the government and many unions believe that the only possible solution is to reduce the size of the informal sector. However, recent experience shows that not even the biggest economic growth in many decades was enough to reestablish a structured and formal labour market. Many believe that the labour movement should look for new answers on how to respond to the current fragmentation of the labour market, including changes in union strategies and structure, in order to include informal workers, and developing income policies for those who are not covered by the collective bargaining. These challenges will need to be faced, but at the same time the labour movement continues the struggles to achieve a substantial increase in the amount of real wages, focusing on the high levels of profit rate that many companies were able to reach during the last decades in Argentina. The non-registered workers do not have access to the social security system (public pension system, protection in case of labour diseases or accidents, etc) and they are not covered by the collective bargaining. In Argentina this category is used as a measure of the informalisation of the labour market. In 2006 the National Government intervened through the National Institute of Statistics (INDEC), with the main objective of manipulating the inflation rate. Since then, it is not possible to know the real inflation in Argentina. The data used in this article are provided by other public institutions, mainly the provincial institutes of statistics and are also used by other agencies of the National Government in their reports. 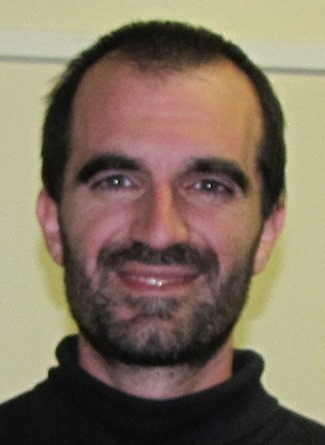 Luis Campos has a PhD in Social Science (Latin American Faculty of Social Science - CONICET). His current research is focused on collective bargaining and labour market, and is based in the Argentinean Workers Union (CTA). Muy interesante Luis. El hueso duro de roer es el de la informalidad.